Firemint’s Real Racing promises to be the first serious racing simulator on the iPhone. Firemint is shooting for Gran Turismo-levels of simulation with Real Racing, rather than just an arcade-style driving game. Though it will not be released until late April, there has already been significant buzz about this title. Firemint Real Racing was awarded the International Mobile Gaming Award for Excellence in Connectivity during a ceremony held at the Mobile World Congress. At the Game Developers Conference (GDC) in San Francisco, Firemint Real Racing walked away with the Technical Achievement Award from the Independent Games Festival Mobile. Robert Murray, founder and CEO of Firemint, showed off the game at GDC. While still an unfinished product, the 3-D graphics are some of the best I’ve seen on the iPhone. 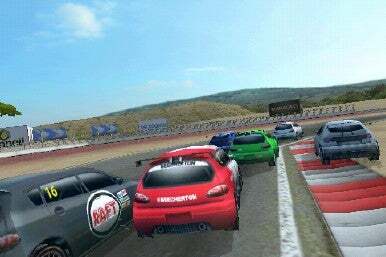 Real Racing has several modes including “Career,” “Quick Race,” “Time Challenge,” and “League Play.” Using the iPhone’s motion sensor controls, I guided my car around a track during a time trial run. Though I crashed a few times initially, the controls quickly became intuitive. Murray demonstrated how Real Racing has different camera views as well. The first person “cockpit” view allows players to see dash instruments showing race data. The animated driver responds to your tilting of the iPhone by turning the wheel and will change gears as you do. There are also a number of different control setups for players who enjoy more or less control over acceleration and braking. But Real Racing’s major innovations may be in the connectivity arena. If the game lives up to the potential recognized by the Mobile Game Congress, Real Racing could be one of the most social 3-D games yet. Firemint developed something called “Cloud Cell technology,” that will enable to games to plug in one side and social media APIs on the other. “It's all connected with a custom-built cloudcell.com Web site in the middle,” explained Alex Peters, Office Manager at Firemint. This means that social functions will not be limited to Real Racing, but be easily added to all future Firemint releases. Firemint’s Real Racing will allow you to create your own YouTube video and share with your friends with just the click of a button. Or, you can play in a league globally and face online competition from around the world. League races provide different ways to play, depending on how involved you want to be in the game. You can jump in and race a couple times per week for certain leagues or more or less frequently depending on how intense the league’s rules are. There’s also a Facebook application to compare scores. Currently, the release version will offer players a dozen tracks, three classes of cars, thirty-six cars, and three racing divisions to unlock and explore. This level of depth and replayability is rare on the iPhone platform and could draw the envy of more than a few dedicating racing fans. The game has been in development for over a year and though no official release date or price has been set, you can watch a trailer of some of the game’s features.